SAN FRANCISCO (MarketWatch) — Investors faced a shortened week, and trading days that were relatively low-volume thanks to Passover and Good Friday. But on the days they were open, markets provided investors with plenty to trade on. Many prominent companies reported quarterly results during the week, including Apple and some of the big banks. Financial companies were still showing scars from the recession while many tech companies were sorting out the impact of the massive earthquake that struck Japan last month. The Dow Jones Industrial Average (DJIA) closed the shortened week on Thursday with a gain of 52.45 points or 0.4% at 12,505.99. For the week the Blue Chip index added 1.3%. The Nasdaq Composite (COMP) ended Thursday up 17.65 points or 0.6% at 2,820.16 making for a weekly gain of 2%. The benchmark Standard & Poor's 500 (SPX) gained 7.02 points or 0.5% on Thursday to close at 1,337.38. For the week the index was up 1.3%. Also, please be sure to watch our Week Ahead videos from the U.S., Europe and Asia. In a move Monday that roiled markets, Standard & Poor's cut its ratings outlook on the U.S. to negative from stable, lighting a fire under Washington's deficit-reduction debate. The rating agency effectively gave Washington a two-year deadline to enact meaningful change, just days after House Budget Committee Chairman Paul Ryan and President Barack Obama outlined their plans for slashing debt. S&P nonetheless kept its highest rating, AAA, on the U.S. Read more about S&P's outlook. Handily topping Wall Street forecasts, Apple Inc. (AAPL) reported a sharp 95% surge in second-quarter profit, boosted by strong sales of the iPhone and Mac computer line. Sales of Apple's latest product — the iPad 2 — remain constrained by production limits, but the iPhone was the main driver of earnings growth in the quarter. Read about Apple's results. Intel Corp.'s (INTC) surprising earnings beat raises a question: Why was Wall Street so wrong on the chip maker's first quarter? Analysts agreed that a key reason for the surprise was conflicting views on trends in the personal-computer market. Read more about Intel's upside surprise . Solid earnings by big tech companies this week ignited technology shares, dispelling concerns about the Japanese earthquake's impact on future earnings. 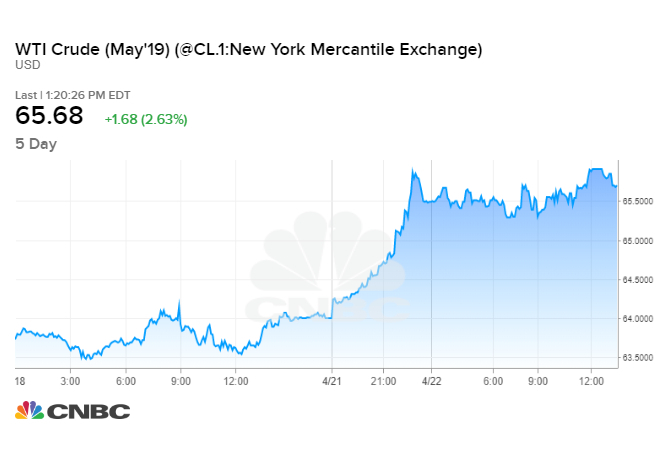 But can the tech rally lift the financial-services sector out of the doldrums, or will persistent weakness in banks and on Wall Street hobble a U.S. economy that appears ready to run? David Callaway's betting on the banks playing bogeyman. Read Callaway's column . BP PLC (UK:BP.) (BP) has filed lawsuits against Transocean Ltd. (RIG), Halliburton Co. (HAL) and Cameron International Corp. (CAM), three of the main contractors it worked with on the Gulf of Mexico rig that blew up last April, setting off the worst oil spill in U.S. history. Read more about BP's legal battle . Restructuring, buybacks or bridge loans. When it comes to Greece, Europe faces a number of choices, none of them pretty, economists say. A controversial 110-billion euro ($160.7 billion) bailout program was put in place a year ago next month. But expectations that the move to help the debt-strapped nation would allow Greece to return to credit markets next year, as originally planned, now appear dashed. Read about Greece's restructuring choices. Japanese earnings season kicks off in earnest next week, with strategists hoping for signs of improvement even as they brace themselves for possible bad news due to last month's disasters. Instead of cutting their forecasts, many companies will likely hold off on releasing any guidance at all for the business year that began this month, as they continue to gauge the impact of the March 11 earthquake, tsunami and subsequent power shortfalls and production shutdowns. Read about what's ahead for Japanese companies. An index of manufacturing sentiment in the Philadelphia area slumped in April to a five-month low, showing growth at a much slower pace, according to a survey released this week. The Philadelphia Fed's index of current activity tumbled to 18.5 in April after a March reading of 43.4, its highest level since January 1984. Economists polled by MarketWatch had expected the gauge to fall to 35.5 in April. Read about the Philly Fed. U.S. builders started construction on homes at a faster rate in March and permits to begin new work also rose, but the home-building industry remains mired in its worst slump ever. Housing starts rose 7.2% in March to an annual rate of 549,000, the Commerce Department said. Economists surveyed by MarketWatch had expected housing starts to climb to 520,000 in March on a seasonally adjusted basis. In a normal economy, however, more than 1 million new homes are usually built each year. Read more about housing data. Time to pay off your mortgage? In a world in which debt is a four-letter word, paying off the home mortgage could be a wise move for many people, providing they take the time to do the math or find a financial adviser who can help. It's not for everyone, however, and is a step that should not be taken without a lot thought about what your priorities and goals are and what stage of life you're in. Read more about whether it makes sense to pay off your mortgage. CBS Breaking News Alert: Apparent twister shuts St. Louis' Lambert Int'l Airport for several days. Sales of new single-family homes in February were down more than 80 percent from the 2005 peak, signaling a shift in behavior from buyers seeking smaller places. Some local governments would like those who succeed not to lord it over others, at least when it comes to paying final respects. "We want revenge, and we want blood." ABU MOHAMED, a protester in Azra, Syria, a southern town that witnessed the highest death toll Friday. Changes in the health care landscape have left Dr. Ronald Sroka with a family practice he cannot sell. A short film by Jeff Scher. Despite a mixed assessment, officials said no great change in tactics was planned in NATO-led air operations. The investigation surrounding a secretive deal to export natural gas to Israel at a low price has already resulted in the arrests of Egypt's former oil minister and five other top officials. An American human rights group said on Friday that the number of physicians missing in Bahrain has risen to more than 30. Dr. Ronald Sroka has been in practice for 32 years, and has a roster of 4,000 patients, but with costs going up and reimbursements going down he is looking for an out. What does it take to make it through the grueling wee hours of an overnight shift? Dusk-to-dawn workers tell their stories. The police say a popular exhibition at MOCA in Los Angeles that celebrates street art is to blame for a rash of graffiti in the neighborhood. An ethics panel investigating Senator John Ensign focused on a $96,000 payment to the family of a woman with whom he had an affair. With the announcement of John Ensign's resignation, Representative Dean Heller is widely expected to be appointed to the Senate and catapulted onto a national stage overnight. The manslaughter charges against four military contractors, stemming from a 2007 shooting in Baghdad, will be returned to a lower court for review. The federal labor board has sought to reinterpret and more vigorously enforce the rules governing employers and employees. Retailers are trying to figure out the pressure points in rising prices. Will people pay more for jeans, but not T-shirts? Companies are expected to reassess backup and recovery after the interruption at Amazon Web Services. The lawsuit comes after a week after Apple accused Samsung of violating patents and trademarks of its iPhone and iPad. The government wants TV broadcasters to give up some of their airwaves to allow for expanded use by cellphones and other mobile applications. The Celtics started the game with a 9-0 run and never relented, crushing the Knicks and building a nearly insurmountable 3-0 series lead. Amar'e Stoudemire has battled back pain in the past two games, not to mention Kevin Garnett, Glenn Davis and the rest of the Celtics front court. Ike Davis's two-run shot in the seventh sent the Mets past the Diamondbacks on a night that started a little shaky for starter Mike Pelfrey. The Illinois Holocaust Museum & Education Center in Skokie is characterized by the participation of survivors, both a strength and, paradoxically, a potential weakness. "Black Watch," a group portrait of Scottish soldiers in Iraq that was first seen here in 2007, returns to St. Ann's Warehouse in Brooklyn. To fight Internet piracy, BBC America won't delay the season premiere of a popular series. Gov. Andrew M. Cuomo's mail comes from a Mount Kisco post office but he sends his taxes to New Castle, a wealthier neighbor. Traffic tickets are now electronically scanned at each stage of their journey through the New York Police Department - once, twice, three times, and then once more. Longtime bowlers at Maple Lanes, in Borough Park, Brooklyn, lost one bowling alley to development and now face the threat of losing another. Deep in the countryside Creole cowboys gather on horseback. When the riding is over, the music starts and the dancing begins. Credit card companies are pitching new travel enticements, from waiving foreign transaction fees that can add up to 3 percent to your purchases abroad to picking up fees for checked baggage. Central America's capital of international finance, called by locals the "Dubai of the Americas," is in the midst of a prolonged boomtown fever. Republicans are tying their ideological goal of spending cuts to the debt limit. The courts need to impose constitutional limits on the searches of laptops by border agents. Representative Debbie Wasserman Schultz has shown real leadership on gun control. President Obama should join her. The Senate Ethics Committee owes the public a full report on its ethics investigation of Senator John Ensign. In authoritarian states, a revolution could break the stranglehold that state-run news media hold over unfree societies. Just look at the changes taking place thanks to all the angry new governors. Why did Spencer Bachus, chairman of the Financial Services Committee, introduce legislation to delay the regulation of derivatives? The destructive game Donald Trump is playing, and its welcome on the right, only exposes the flaws in American ideology and further corrodes the Republican brand. On April 23, 1969, Sirhan Sirhan was sentenced to death for assassinating New York Sen. Robert F. Kennedy. The sentence was later reduced to life imprisonment. It was the biggest single-day death toll in a six-week-old uprising, and it offered no sign that Damascus government might give way to swelling demands for democratic change. Seeking the offensive, Democrats this week launched a media campaign accusing GOP House members of endangering retirees. U.S. Court of Appeals for Veterans Claims is a symbol of the accumulating toll of prolonged war, both on soldiers and the bureaucracies created to serve them. Friends and relatives of a 24-year-old University of Maryland graduate student can’t imagine why he was killed after leaving a D.C. nightclub. Neither can police. After 14 years, GMU basketball coach Jim Larranaga leaves behind a school transformed for the University of Miami for more than twice the pay. WASHINGTON — It’s the conspiracy theory that won’t go away. And it’s forcing Republican officials and presidential contenders to pick sides: Do they think Barack Obama was born outside the United States and disqualified to be president? A Montgomery County union says Isiah Leggett broke the law, but the county executive counters that the county charter trumps that law. As state legislatures adjourn in the coming weeks, new Republican majorities backed by GOP governors are leaving their mark in a wave of legislation that reaches beyond the economic issues that dominated the midterm elections last fall. Pollster Cornell Belcher talks about life growing up in the South, where the image of a Confederate flag loomed large. ANAHEIM, Calif. — Dan Haren had allowed only one unearned run over his previous 22 starts. On Friday night, the Boston Red Sox scored two on a mixup in the Angels’ outfield, and it was a great comfort to Jon Lester — who didn’t need any extra help. ST. LOUIS — Brandon Phillips blamed the loss that knocked the Cincinnati Reds out of first place for the first time this season on dumb play. INGLEWOOD, Calif. — Favored American Story defeated Crisis of Spirit by 2½ lengths to win the $71,500 optional claimer on Friday at Hollywood Park. SEATTLE — All the right things are being said about Oakland’s sudden offensive slump. ARLINGTON, Texas — Jeff Francis had been off to a strong start for the Kansas City Royals. MANILA, Philippines — Philippine officials are losing hope of finding survivors among 21 people still buried in a landslide that killed at least three people after crashing onto a remote gold mining village in a southern province. WELLINGTON, New Zealand — A powerful earthquake struck in waters off the Solomon Islands in the South Pacific on Saturday, but there were no immediate reports of injuries or damage, and no tsunami was expected. BEIJING — The mysterious removal of a statue of Confucius opposite Beijing’s Tiananmen Square has left many Chinese looking for an explanation. One report says the monument was simply moved inside a nearby museum. KABUL, Afghanistan — A coalition helicopter crashed in eastern Afghanistan Saturday, but both crew members have been recovered alive, NATO said. BEIJING — Two people have died in a clash with Chinese police raiding a Tibetan Buddhist monastery where tensions have run high over the recent suicide of a monk, an activist group said Saturday. Liberty chief executive Greg Maffei talked to The Post about transformation in his industry and discussed the much-anticipated Starz contract re-negotiation with Netflix. WASHINGTON — A year after the largest offshore oil spill in U.S. history, some experts are pondering the next doomsday scenario — a massive oil well blowout in the icy waters off Alaska’s northern coast. BEIJING — Authorities in China’s commercial hub of Shanghai say they are easing fees that sparked trucker protests and disrupted the flow of goods through the country’s busiest port. The suit accused the bank of overcharging service members, prompting a federal investigation. Jared Bernstein is the latest official to leave as the White House crafts its strategy for a battle over nation’s ballooning debt and for the 2012 race. Democracy in America wonders why only Republican budget plans are considered "courageous"